Most would say the Bruins overachieved last season. Charlie McAvoy and Jake DeBrusk had outstanding rookie campaigns. At age 21, David Pastrnak played in all 82 games on his way to 35 goals and 45 assists. In order for them to sustain that success, a lot of things will need to go right in 2018-19. 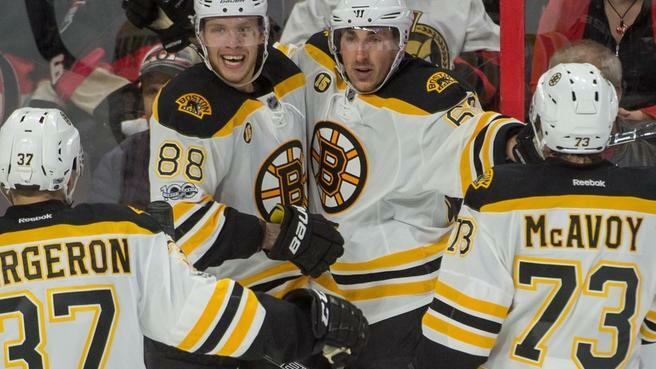 If the top unit of Pastrnak, Patrice Bergeron, and Brad Marchand can stay healthy and the young guys play at the same level or continue to improve, we could be looking at one hell of a season. The B’s also have one of the deepest bluelines in hockey. Tuukka Rask is still a relatively reliable goaltender, and if he goes down they now have one of the best back-ups in the league in Jaroslav Halak. These are all factors that can carry a team a long way. The bad news is that not all of them are guaranteed. There’s the chance that McAvoy, DeBrusk, or any of the five rookies who played over their heads last year could fall victim to the sophomore slump. If that happens, the Bruins don’t have enough to make up for it, especially at forward. A serious injury to a key player could be an insurmountable setback for a team that’s noticeably top-heavy when it comes to forward depth. There isn’t much beyond the first line aside from David Krejci, who’s grown increasingly inconsistent over the last few years. Zdeno Chara is in great shape for a 41 year-old, but he’s still a 41 year-old. These days he’s looking a lot stronger in the gym than he is on the ice. If things don’t go perfectly for this Bruins team, we’re probably looking at a slight regression from last season. Expect them to fight for a wild card spot.